Himalaya Fine Art near CST in South Mumbai is a treasure trove for painters, artists and art enthusiasts. If you have been meaning to start painting or are already a professional painter/ artist, South Mumbai has a gem that will baffle you with the variety it has. Himalaya Fine Art, located opposite JJ School Of Applied Arts. 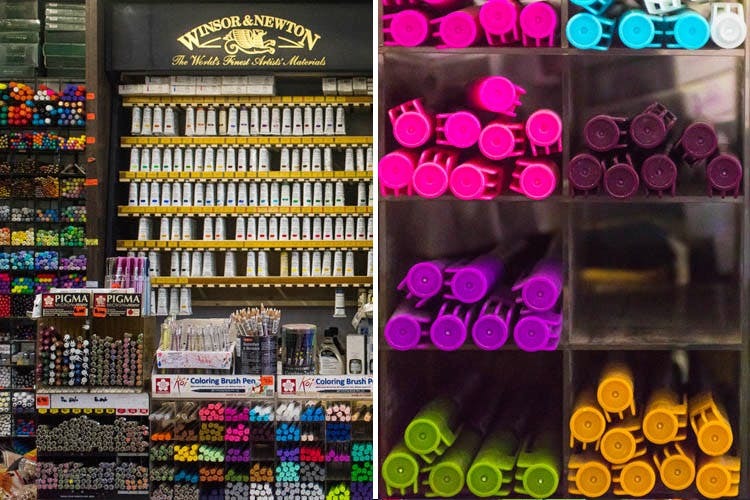 The store houses rare art supplies, something you won’t get at your next lane stationery shop. Think seagrass painting sponges (INR 395), gold leaf (INR 920), natural charcoal (INR 735), calligraphy pens, airbrush systems (INR 563 upwards) and more. The shop has been a students’ choice for art supplies and we also saw a bunch of professional painters raving about the collection there. The shopkeepers are friendly and will cater to specific needs too. Now, whether you have been skeptical to get your art hobby rolling or are a student, head on over to Himalaya Fine Art. They also have an online presence.